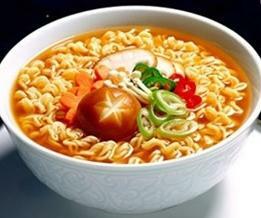 Shin ramyun is a staple noodle soup with a traditional spicy taste for all Asians worldwide. It is very easy to prepare yet a satisfying meal which can be prepared within ten minutes. All the ingredients are found within the package and additional ingredients such as kimchi, egg, green onions can be added to enhance its flavors and texture. Nong Shim, the manufacturer of Shin ramen first introduced its noodles in 1986 and it is known to be very popular in Japan, US, Hong Kong, Taiwan and China. Other popular ramyuns (or ramens) from Nong Shim are Neoguri and Kimchi ramyun. To see other brands of instant noodles, click here. Fact: Nong Shim noodles are considered to be one of the top selling ramyun in the world. Noodle: Wheat flour, palm oil, modified potato starch, salt. Powdered soup: salt, glucose, garlic, monosodium glutamate, sugar. Vegetable flake: dried carrot, dried green onion, and dried seaweed. Boil 2 ¾ cup of water in a pot. Put the noodle and 2 soup bases all together. Cover & let it simmer for additional 4-5 minutes. For improved taste, feel free to add kimchi, green onion, egg, spam or anything else that sounds appealing!